For greige polish and a peony lipstick that flatters both light and dark skin tones, go with Dior nail oplish in Pied-de-Poule and Revlon lipstick in Ready to Wear. Red on red can be a thing with Essie nail polish in Dress to Kilt and Aveda lipstick in Sheer Fig. Deep colors go great with dark skin. Try OPI nail polish in Do You Have This Color in Stockholm? and Avon lipstick in Power Plum. Lighter colors go great with warm fall colors for a look good for any season. 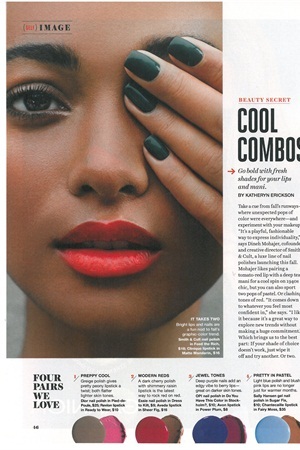 What works is Sally Hansen gel nail polish in Sugar Fix and Chantecaille lipstick in Fairy Moss.